This triplexer utilizes three output ports which contain three different types of filters, lowpass, high pass, and bandpass. The three ports work simultaneously to maintain their respective specifications per filter type. 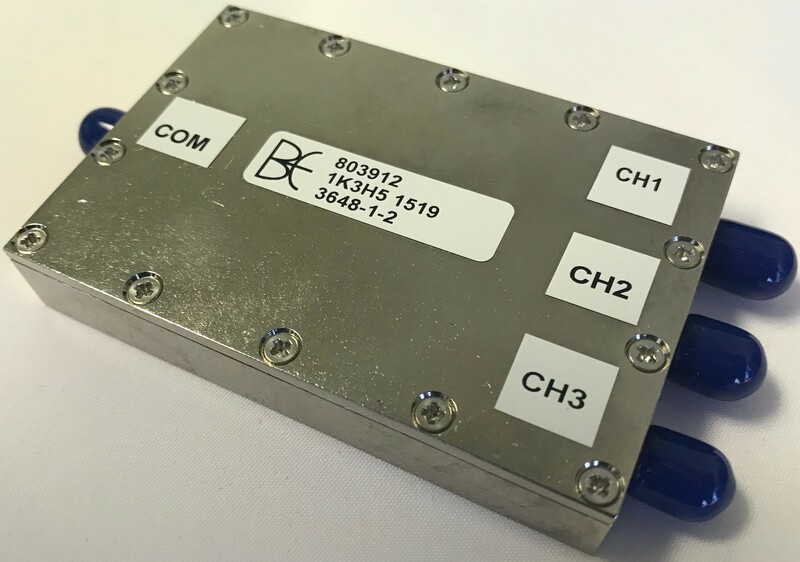 The uniqueness regarding this Triplexer is the proximity of the frequency specifications, between channels 1 and 2 we have 60 MHz separating 1620 and 1680 MHz with insertion loss specification less than 4.5 dB. The difference between channels 2 and 3 are also very close showing a 100 MHz difference between 2200 MHz and 2300 MHz, leaving an insertion loss performance of less than 4.5 dB. As with all of our Filters here at Bree Engineering the design is custom and tailored to the specifications of our clients. We are always striving to do our best to design, build and tune Filters of any type. Please see the attached Filter Test Data for the performance of the filter.